Hey!! How are you doing? I have been away for quite some time. I have been working on spring cleaning projects around the house and loving the results. I have come to realize that I attach way too much sentimental thoughts to “things” in my home and this year, I am turning it on it’s head with my spring cleaning efforts. I began a few weeks ago and cleaned out my craft room and restructure it’s layout and I am more than half way complete and love the energy when I enter the space. More on that later. While in college I first came across literature that taught me about the Japanese Internment camps here in the US. I never came across this information prior to then and I was surprised. I had this first book on my TBR list for a while and while in New Jersey last month, I purchased it. 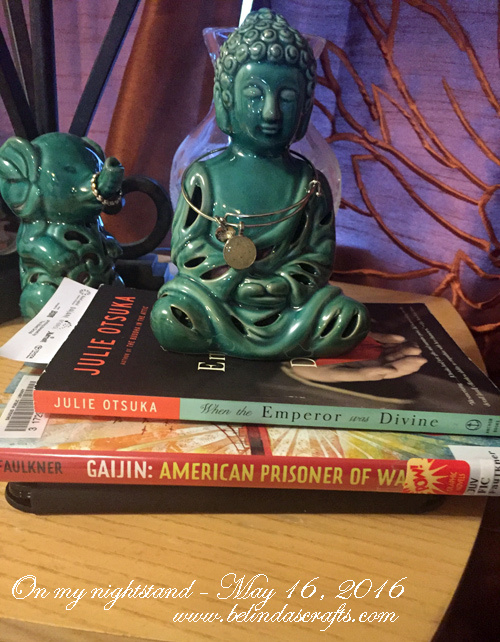 The book is called, “When the Emperor was Divine” by Julie Otsuka. It is a historical fiction following a family to an internment camp in Utah. 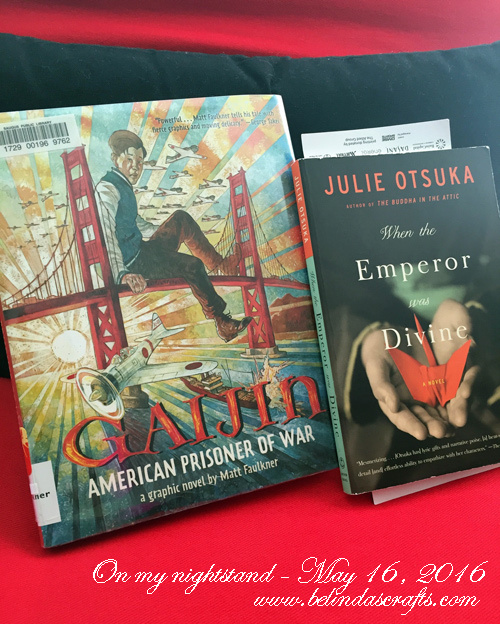 The second book called, “Gaijin: American Prisoner of War” is a graphic novel I came across at the library and decided it would be nice to see another approach to the topic. 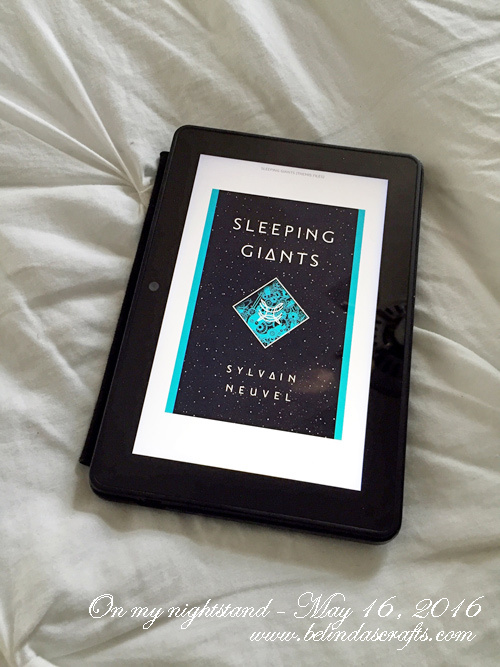 My third read is a brand new science fiction release by Sylvain Neuvel called, “Sleeping Giants“. I put myself on the wait list for this book a while back and was so thrilled when it came in last week. I am really enjoying this story and just found out it is the beginning of a series. So if you don’t like long waits, then I would hold off a while since the next book is slated for the summer of 2017. 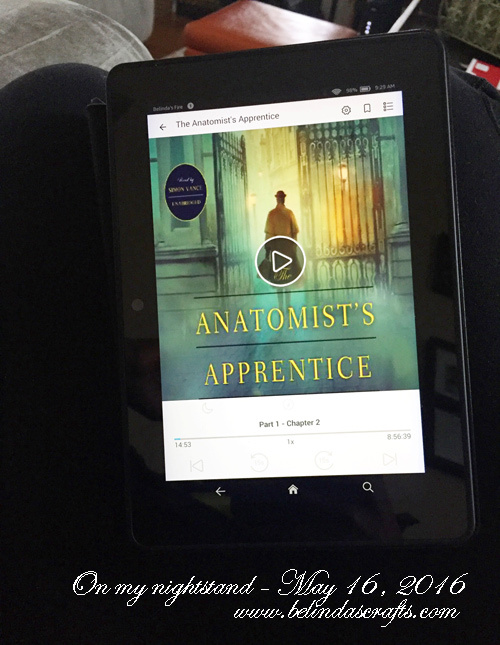 My final book is an audiobook by Tessa Harris and is called, “The Anatomist’s Apprentice“. It is a the beginning of a mystery series set in eighteenth-century England featuring an anatomist and the first forensic detective. It sounds very interesting and I just started listening to it today at work. So I will keep you posted. So those are what’s on my nightstand. What are you reading right now?